The entrance to the Kotvata restaurant is situated on the main street. There is also direct access from the outdoor pools and water attractions to the restaurant for the convenience of our guests. The restaurant is developed in height, allowing for separation of seating areas. The interior is modern and features a variety of natural materials, creating a unique and cozy atmosphere. The spacious terrace of the restaurant offers a breathtaking panoramic view of the pools and the mountain. 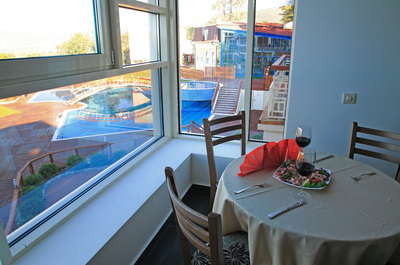 There you can have a nice lunch with friends or a romantic dinner and enjoy the beautiful views. The menu offers a variety of meals and drinks that can satisfy even the most demanding taste. The delicious fresh fish dishes are a natural end to a day at the poolside. For the fans of traditional Bulgarian cuisine the menu offers regional and homemade dishes. You can pre-order specially prepared meat and vegetarian dishes of your choice. The team of Kotvata restaurant would love to meet you and your friends on all kinds of special occasions, meetings and gatherings that you might plan.